Mike Jones was flummoxed. All his life he’d used the expression, presuming everyone knew the idiom. Maybe that was true until last week, when Mike’s utterance was met by a circle of blank faces. Admittedly, most faces in the meeting were Asiatic, which possibly betrayed a cultural gap. Yet surely the universe was wise to the analogy: to separate the sheep from the goats? Not this time round clearly. The questions only snowballed – why sheep? What do goats symbolise? Which flock is bad, and which is good? Besides, aren’t sheep and goats companion animals? “I was stumped,” confessed Mike. “I had a good sense of the meaning, but when asked – well…” That’s where things turned woolly. After the confab, the bloke went Googling in vain. He tried Wikipedia – nada. Even the Collins definition – to pick out the superior members – left the matter debatable. The translation belongs to the King James Version, dated 1611. As the excerpt stands, the Lord is earmarking one species for the kingdom’s inheritance, while the other half can baste in eternal flames. Yet curiously, readers can only infer the blessed to be ovine, and the damnable as caprine, since neither flock is spelt out. 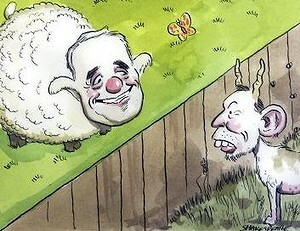 Smart money prefers the sheep. After all, the faithful flock is a persistent trope, while goats were “scaped” back in Exodus, the blame-bearers sent to the wilderness. Or so runs the logic, a theory built on sand and stereotype. David Crystal, the mercurial British linguist, divines the expression, and 256 others we’ve gained from the King James Bible. In his 2010 book, Begat, Crystal sifted the scriptures to isolate such classics as born-again, two-edged sword and bite the dust. This last relic hails from Psalm 72, though the King James text asserted “his enemies shall lick the dust”. While the Wycliffe Bible of 1395 preferred “her tongue passed in earth”. Then again, Homer’s Iliad predates both tomes by a good millennium, claiming one gored Trojan “bites the bloody sand”. Typical muddle, according to Crystal, whose job it was to separate the trailblazer from the sheep, so to speak. A second challenge was parsing the Bible’s nuance. If sheep and goats weren’t troublesome enough, then try casting your bread upon the waters. Ecclesiastes is the genesis. Somehow the phrase can mean anything from living lavishly to spreading knowledge. Most dictionaries plump for “doing good without expecting gratitude”, but that’s hardly consensus. Fact being, nobody “knows for certain” (a phrase debuting in 1 Kings 2:37), the idiom “a law unto itself” (Romans 2:14). Phrase-wise, headline writers owe one big debt to the Bible. The Gospels alone have delivered first stones and crosses to bear. Though the handiest idiom must be a sign of the times (Matthew 16), which tabloids have reshaped into Whine of the Times, Swine of the Times and even Strine of the Times, for an article on how we speak as a nation. But let’s return to sheep and goats, since the phrase resounded this month. If it wasn’t Mike’s plea, then it was our erstwhile PM seeking to triage Syrian refugees. Mr Abbott’s reckoner was Christian versus non-Christian, just as the figurative shepherd had his own crook as yardstick. The irony is rich. In a twilight bid to win hearts and minds (Philippians 4:7), Abbott moved to split the hordes into savable and shunned. With one small hitch. Observers are still trying to puzzle out which mob – the Christian imports, the Muslim outcasts, or perhaps their actual dividers – embody the ultimate baddies deserving of damnation. As the prophet Jeremiah reminded us, “Be afraid, be horribly afraid”. David Astle’s Riddledom is published by Allen & Unwin at $29.99. Great, entertaining, as well as interesting stuff, Emms. I see you haven’t lost your touch. I cannot tell a lie. David Astle wrote the piece…. but I asked the question that gave him the idea chuff chuff chuff. We never missed a Letters and Numbers. Goats make better eating, in my opinion. I’m trying to find where Jesus said that there is a place for everyone, but, for many, that place is not Australia. Nice work, Emmjay, good to see you’re back in the saddle. Thanks, Big ! Been a bit flat out as I’m sure you can imagine. It was quite a surprise when I emailed David Astle about the sheep and the goats … and got not just a reply, but a request to turn the issue into a column. He writes well – which I’m sure is no accident.